For ski racers, carving is an essential technique, the quickest way to descend any piste, moving less snow and conserving as much energy as possible. The cold conditions, and the constant shifting of body weight puts unique stresses on the legs, requiring equally unique solutions, such as those in these Swiss-engineered X-Socks Ski Carving with Sinofit Technology Skiing Socks. These ski socks help stabilise vulnerable ankles, promote swift reactions and boot/ski responses, and retain heat, but transmit moist warm air outwards as possible via AirConditioning Channels at the footbed. 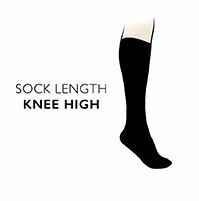 The socks incorporate ten special support and padding features to help your feet at the shin, calf, heel, Achilles tendon, instep, toe and toe-tip, plus side protectors to regulate boot-shaft pressure. Patented X-Cross bandages surround the ankles for added stability, and anatomically-shaped footbeds ensure padding is placed precisely for optimal grip. Pain from pressure points, scraping, bruising and blistering is significantly reduced. Usual skier hazards like foot odour and athlete’s foot are eliminated, thanks to Sinofit, loops of 99.9 % pure SilverNODOR fibres, double-layered with Mythlan fibres for fabric that restricts bacteria growth, is breathable and anti-allergenic.